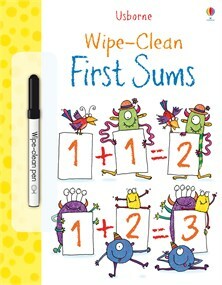 This fun book is a perfect way to help young children learn how to do simple sums, allowing them to practise time and time again using the special wipe-clean pen. Children will have fun learning basic maths skills as they help the monsters with their sums, including counting balloons at a birthday party and adding up the monsters’ eyes and teeth! A brilliant, interactive way to introduce simple additions and subtractions, with fun illustrations to engage young minds.